The natural environment has always been close to my heart, and I was lucky enough to be born and brought up in a rural idyll in Wales. Walking and painting in this stunningly beautiful countryside has heightened my awareness of what we are about to lose if the British government’s plans for the industrialisation of most of Mid-Wales with gigantic wind turbines goes ahead. 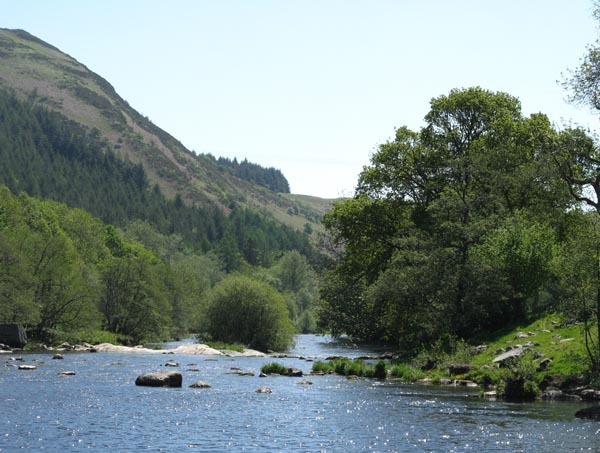 This is not confined to Mid-Wales, and the devastating effects on a hitherto unprecedented scale will most certainly not be limited to just the destruction of this glorious landscape, but has cataclysmic consequences for the local population. Tourism is the lifeblood of our region, but how many tourists will come to see hills and moors flooded with wind turbines, completely dwarfing every other feature in the landscape? The local economy will be destroyed and a great many small businesses, including artists and crafts-people, will fold up. The authorities tell us that there will be around seven years of over-size, slow-moving convoys carrying turbines, clagging up our roads, needing new bridges, re-aligned bends and demolished street furniture, while at the same time under-mining old buildings beside the roads: visitors, locals and emergency services will be badly affected. Turbines, despite government ‘reassurances’, create an insidious low-frequency noise that many people simply cannot live with, and some have to abandon their homes. Many homes become unsellable. Most have their value reduced considerably. Turbines explode and catch fire at times, when they become highly dangerous as they emit toxic fumes over a wide area. A report in Scotland states that for every wind energy job created 3.7 jobs are lost. Would all this sacrifice be acceptable if wind energy was an effective energy system? This is rather academic, as wind, given its intermittency, produces such little power and needs so much back-up from conventional power stations that large-scale wind farms can only be seen as a great liability. It is, however, an extremely effective source of income for the developers, for energy corporations (most of whom are foreign and therefore making a joke of government policy), for large land-owners and for many politicians. At the expense of local people, many on the poverty line. This entry was posted in David Bellamy, wind energy devastating countryside by David Bellamy. Bookmark the permalink. I thought that such things as ignoring the views of the local people, and the thrusting of unwanted policies happened only in my part of the world, and in other developing countries. I guess that greed and the desire to acquire and wield power are universal traits. Let’s also not mention how the wind turbines kill birds like crazy unless special netting is put up. The environmentalists try to cover up that sad and gross fact about the wind turbines. No one wants to hear the truth about how they are so ineffective in most regions of the world. Sadly people care more about the “feel good” nature of things and like the idea of things they don’t want real facts and if you try to enlighten them they call you negative and say you have a closed mind or that you are anti-environment and other such things when in fact they are ignorant and being unrealistic to just believe the idea of a thing and not look at real facts then make a judgement after considering everything. You’re absolutely right, Christine, and sadly many politicians don’t want to know the truth either. Have you seen Mark Duchamp’s excellent site http://www.iberica2000.org in which he reveals how the RSPB make vast amounts of money from wind energy? I wonder how many RSPB members are aware that RSPB executives are contributing to the mass slaughter of birds in this way?